1 dried red chilli cut into pieces. 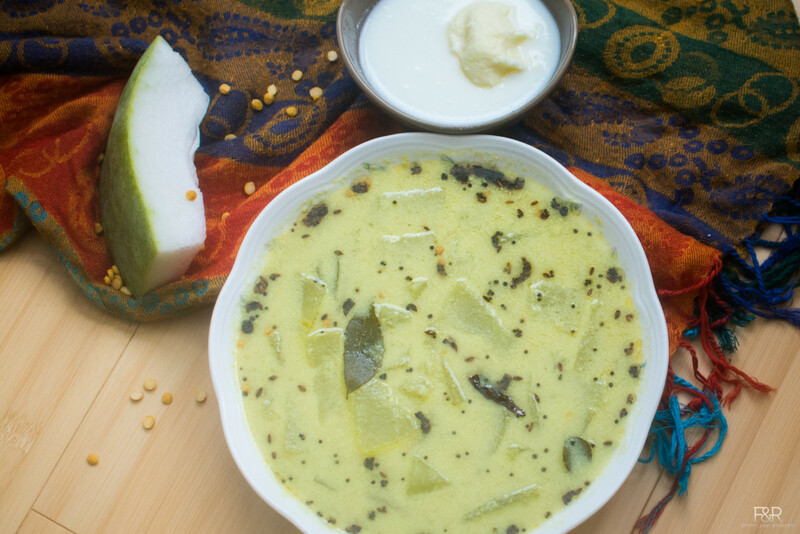 Cook the ash gourd/boodhu kumbaLakaayi in a thick bottom pan along with 2 cups of water, curry leaves, salt, and turmeric powder. While it is cooking, grind the masala (coconut, soaked dal, green chilllies, jeera, coriander leaves) into a fine paste. Add this to the vegetable and let it cook o a medium low heat. Now pulse the yogurt with a little water and add this to the boiling mix. Add water as needed to get the right consistency. Let it boil for some more time and then turn off the stove. Heat the oil in a ladle and add hing, cumin/jeera. When jeera starts popping, add dried red chili and turn off the heat. Pour it on the Majjige HuLi. Majjige HuLi is ready to serve with hot rice or akki rotti.